This psalter is not of the most deluxe type--it has no gold or representational imagery, for example--but it is fairly typical of the high quality manuscripts that would have existed in their thousands in English churches before the Reformation. The Calendar and Litany show that it was made for use at Norwich: the litany includes local saints such as William (a twelve year old boy supposedly murdered by Jews), and the calendar commemorates many of the cathedral priory's bishops and priors. 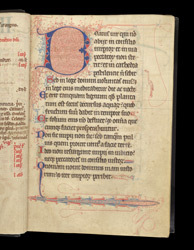 The decoration of the manuscript is in red and blue throughout. The initial 'B' of Psalm 1 (Beatus vir -- Blessed is the man) is filled and surrounded by very fine penwork flourishing, which extends into the right-hand margin with a heron(? ), and into the lower margin with a human-headed hybrid creature.